Two days after promising he would back a gay marriage bill, Chile Senator Fulvio Rossi, the president of the Socialist Party, introduced the measure on Tuesday, the Spanish news agency EFE reported. “We are establishing more rights, we are deepening democracy, and we are establishing that marriage, or the right to marry, is a human right,” Rossi said in introducing the bill. The measure seeks to alter the definition of marriage in Chile's civil code from a contract between “a man and a woman” to one between two persons and strike out a reference to procreation. 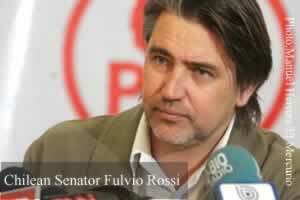 Senators Isabel Allende (PS) and Guido Girardi (PPD) joined Rossi in introducing the bill. Also attending the presentation were representatives from the Movimiento de Integracio y Liberacion Homosexual (Movilh), the nation's largest gay advocate. It is the first officially introduced gay marriage bill in Latin America since Argentina became the first country in the region to legalize the institution. Argentina's neighbors Uruguay and Paraguay have also announced plans to consider similar measures. Cardinal Francisco Javier Errazuriz, the archbishop of Santiago, spoke out Saturday against Argentina's gay marriage law, which went into effect Friday. “It may be that two people, two men or two women, want to live together and share life, but to call that marriage is an aberration,” he said. The proposal does not include the adoption of children, but Rossi has said he hopes to debate the issue at a later date. A recently approved gay marriage bill in Portugal excludes the right to adopt. Lawmakers are already considering a set of reforms called the Acuerdo de Vida en Comun (AVC) which would give both gay and straight couples all the rights and obligations of marriage. Its sponsor, Senator Andres Allamand (RN), said “marriage should be reserved for a heterosexual relationship,” but added that he opposes discrimination in the law. Chilean President Sebastian Pinera holds a similar view. He's publicly backed the AVC, but his party, the Renovacio Nacional, has already rejected the idea of legalizing gay marriage in the Catholic stronghold.